The "Easter Egg Chicken", This unusual breed gets its name from the Indian tribe of Chile where they were first discovered. Araucanas lay beautiful colored eggs of blue-green shades from turquoise to deep olive. These natural Easter Eggs will amaze your friends and make a great "show and tell" project for school. 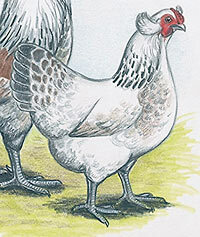 Adults are of medium size with pea combs and our breeding stock is selected for their ability to produce colored eggs. They exhibit a wonderful combination of colors and color patterns and 10 or 20 of these birds make an absolutely beautiful laying flock that is extremely hardy and will be the talk of the town. Baby chicks come in all colors, plain and fancy, just like the adults. This is a unique breed and great fun to have when the colored eggs start coming. Our Araucanas are recommended for egg laying color and ability and not for exhibition.